Postcards from Manila: #87 Is it a Sunrise or a Sunset? #87 Is it a Sunrise or a Sunset? Someone once asked if, from a picture alone, I could tell a sunrise from a sunset. Not easy. 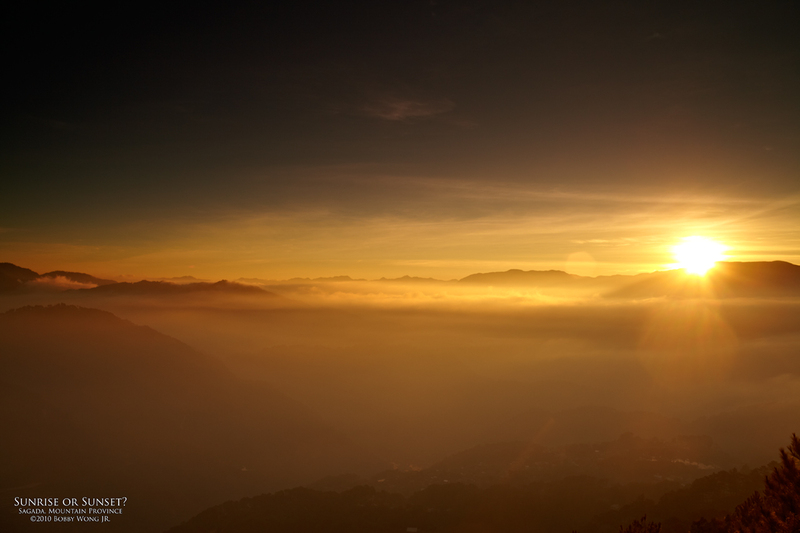 We were on a mountain ledge somewhere in Sagada in the Mountain Province, and it was a sunrise. We were high enough above the clouds so the sky was clear but the land enveloped in a dreamy mist. Forcing oneself to look just at the emerging sun and the sky, a sunrise and sunset would look identical. The color of the sky and the randomness of the clouds hold little clue to differentiate the two. But there is a way: look at the land. Mist and fog are mostly seen only at sunrise, and if the photograph contains a boat or two, only smaller boats venture out at that time of the day. Are the animals and people in the composition? We all know where they should be at sunrise! Still, both sunrise and sunset are my favorite times of the day... maybe I should have said... Does it matter? Enjoy. Where in the world is Sagada in the Mountain Province?